I mentioned in an earlier post that the pattern "spools" by Camille Roskelley for thimble blossoms was on my Summer To Do list. A couple of friends mentioned they wanted to make this adorable quilt too so we thought we would have ourselves a little Spool-Along Sew-Along. Then Nicole mentioned the Spool-Along Sew-Along on her blog and some folks asked if they could join in. Ya know what's more fun than sewing with a few friends, sewing with a few more! Then Camille mentioned our Spool-Along Sew-Along on her blog, and some more folks thought they would like to join in. So just in case you hadn't heard, there's a Spool-Along Sew-Along going on and your invited to join in too! Here are the rules, there aren't any! Just make this quilt and send a note to Nicole, Lisa or myself and we'll blog about it. At the end of the summer we'll have a little parade and a giveaway of some sort. We'll blog about finishes and updates every now and then, it's summer, so it's an easy peasy lemon squeezy sort of affair. You don't need a blog to join us. So pick out some fabric, get the pattern and let us know how you're doing. Don't have the pattern yet, I have an extra one, leave a comment on this post to be eligible to win it. I'll announce the winner on Friday. In your comment let me know what fabric you think you would like to use to make your spools quilt. 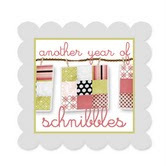 Lisa's got a jump start on Nicole and I, visit her blog if you've not seen her spools. Finally, I've created a Pinterest Spools Board with 3 very cute finished Spool quilts, I hope to add yours to the list! Very fun indeed. I think I would be tempted to cut into my red/white collection but, that's subject to change! thanks for taunting us and a chance @ this cute pattern! I can't resist and just have to leave a comment here ;-). The spool pattern looks great and I would love to made some spools. Such a cute pattern. Not that I need to start another project, but I think this would be a great place to use my selvedge edges for the thread part of the pattern. Wouldn't that be cute? I would love to have the pattern so I can join along. Thanks for the offering. I want to join, but don't have the pattern. I have thinking I would like to make it in Kansas Troubles fabrics. Oh, I've not seen this pattern... would love to win. Not sure about fabric choices but definitely something from my stash. I do have a wonderful brown batik perfect for the spool! Thanks for the chance! I would love to make this pattern out of my batik bin. It would be a vibrant tribute to our favorite past time! Gostaria de fazer uma para o berço de minha neta,com tecidos que já tenho,que são de vestuário infantil 100% algodão,tem bolinhas,jujubas,casas e muitas flores.Só trabalho com sucatas mas,está chegando uns KONA sólidos.Obrigada.Sou brasileira. I just went on a shop hop and found some fabulous fabrics to buy in blues and reds and yellows...for sure I'd use that! What a fun idea! I would use scraps to make it because I like a lot of different colors. Thanks for the giveaway! This pattern is calling to my stash of Galifornia Girl! Have fun!!! I love my Spools quilt and it was a ton of fun to make. This sounds like fun. I would probably use my happy scraps! I have some Ruby fabric that would look great with that pattern. Thanks for the giveaway! I think I would use California Girl and then either grey or brown fat quarters for the spools. I would use batik scraps to wrap my spools. Thanks for the oportunity to win. This quilt keeps calling to me, it would be great to win the pattern. I think I would use some California Girl...or maybe batiks.....or maybe raid the scrap bin.....or.... Thanks for the giveaway. I'm looking forward to seeing the beautiful results of the quilt-along. My pattern arrived last week. I want to join the quilt along. I have to decide what fabric to use. I have some California Girl, Ruby, Vintage Modern or scraps. Gotta make up my mind! I just purchased this pattern and would love to join you in your in your sew along :-D How fun ! I think I would like to use something from the Fig Tree line. I haven't worked with those colors in awhile. So fun and cute! Love the no stress approach too! I'd love to use marmalade like the sample on the pattern cover, but I'm thinking some Wee Play that I've hoarded might be fun too! Aren't they cute!! Would love to win the pattern. Thanks so much for hosting and allowing us to join in! I like the staggered sppols version the best. A nice way to showcase some nice fabric. I have French General fabrics that would make a lovely Spool Along quilt. All I need is a pattern!!! Thanks for offering one. I'd love to win the pattern. What a great quilt for a sewing room wall. I still have some Ruby fabric left so would probably use it as Marmalade hasn't hit the stores yet. Tell you what: if I win the pattern, I'll join your Spool-Along Sew-Along this summer, though I don't know yet with what fabrics. Otherwise, I'll add Spools to my list of future projects because I just love that pattern! Work and a new puppy have stopped me quilting of late but this pattern could be the jump start I need! My local quilt shop ordered the pattern for me and I'm picking it up today! Can't wait to get started. I already have the pattern, but I am getting ready to start on my project. I just ordered a variety of half yard cuts of Muslin Mates in the natural colorway for the spool fabric. I think it will be just perfect. I haven't decided on which collection I want to start with for the thread yet - so many possibilities! I'm thinking of having the last spool on the bottom right appear to be running out of thread and embroider a line of 'thread' off the spool and onto a needle... Just thinking out loud here... Can't wait to see more pictures posted! I would love to win this pattern. I'd use up some of my Fig Tree scraps - beauty~! I saw this quilt at a show this month, and thought it was sooo cute! I'd luv to win the pattern! I would love to have this quilt pattern. It just looks fun! Thanks for the chance at your giveaway. Well what could be better than no rules right ???? I would love to give it a go. Thinking that I would go fig tree scrappy cause I have alot of that :) Thanks so much for the chance !!! I have this quilt on my to do list though I have not yet bought the pattern..thanks for the encouragment and chance to win! I would love the pattern and doing the spool along....but not sure about what fabrics to use. Thank you Thelma for writing about this! I will also post on it this Friday. I would love to win this pattern and I would use fabric from my way-too-large stash!Thanks for the chance to win! I think it would be fun to make it in scrappy color groups from my stash. Although, after looking at the Pinterest post, I love the California Girl spools. Looking forward to seeing all the assorted spool quilts! I'd love to win the pattern. I've never participated in a sew along. It would be great fun. I'd probably use some of my stash and make each spool a different color. I love your idea of a spool sew along...and I have some gorgeous teals that are waiting to be used...think they would be perfect if I were to win this pattern. Thanks for the chance! What a fun sew along...never did one, might have to try it, especially if I won the pattern. .. Thanks! I keep coming back to this pattern; it's such a fun quilt! I have some 3Sisters I've been (hording) saving; I think this could be the quilt for it. I have loved this pattern ever since Camille debuted it! While I love the Marmelade collection that she used, I am a scrap quilter at heart, so my spools would have to be scrappy :-). Thanks for the giveaway! Thelma, what a great idea. That is one adorable quilt. I especially like the one where the spools are off set. i just love this pattern and it is on my list to-do as well, so the pattern giveaway is a lovely idea. I will be keeping my fingers crossed...(toes too!!). what a great pattern....and I will probably use up my scraps for this one! I love this pattern. I would like to make it out of either a group of Bliss fabrics I still have or some Minick and Simpson scraps I have. 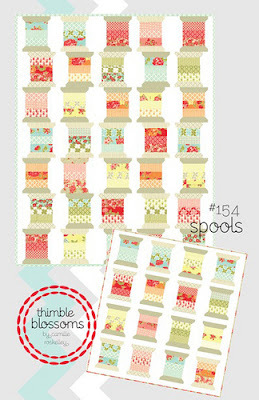 I may get some solids for this spool quilt if I win..hoping so though cuz it is pretty darn sweet! Oh, I would love to make the spool quilt with Aunt Grace's 30's reproduction fabrics. What fun that would be.....of course I need the pattern first!!! Hope I can still join the give away of the pattern. I will make it with total scraps. What amfun quilt. I would love to win the pattern and "quilt along"! Hurray, it's time for the parade . . .
Hubba Hubba I'm Lov'n my Hubbel! Spool- Along Sew-Along . . .
All in a day's work . . . .
Another Tools Tuesday . . . . 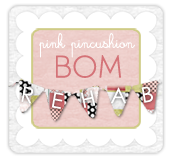 Hot mess with a side of bliss . . . .
Christmas in July . . . .
Free Spirit Medley Update . . . .
Tools Tuesday . . . . .
"T Stands for Thelma" . . . . It's July . . .